Frequently, stems serve to store food (e.g. cactus stems store water; tubers store nutrients), it carry on photosynthesis, and may reproduce new plants. It is generally aerial but also below the ground, node occurs where a leaf attaches and internode is the region between nodes; nodes and internode identify a stem even if it is underground. Tree use woody tissue to support stems. 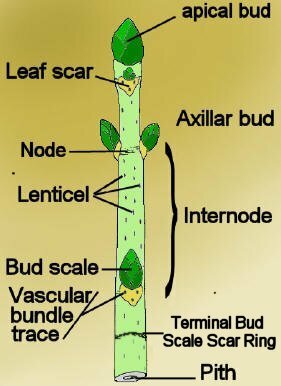 Apical (terminal) bud: The primary growing point located at the apex (tip)of the stem. Axillary ( lateral) bud: A bud that develops in the axil of a leaf . Internode A region of stem between nodes. The plant part that supports the leaves, flowers or fruits of a plant, as the peduncle of a fruit, the pedicel of a flower or the petiole or leaf-stem. Also the midvein or rachis of a leaf.